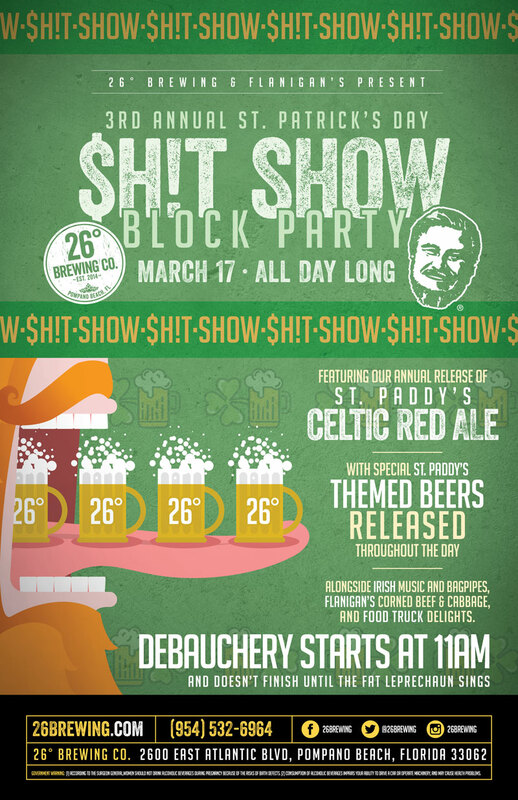 If you were here last year, you know that there’s no Block Party in Pompano Beach like a St Paddy’s Day Party at 26° Brewing Co! Tons of special St Paddy’s Day beers, Bagpipes, green beer, special Flanigan’s food menu served in our taproom, food trucks, outdoor beer tents…you name it. This will be a party you don’t want to miss. Our traditional, Irish Red is in the fermenters now and will be making its grand reappearance (this year we are making a special, lager version). Beer tents and entertainment in the parking lot (it’s like tailgating only no sports game). Flanigan’s Seafood Bar and Grill authentic Irish cuisine will be available in the taproom. Food Trucks in the parking lot. We look forward to hosting the day you may or not remember, but we do guarantee you a stupid amount of FUN! Cheers! Big Barrel Aged Beer Bonanza! We are celebrating Big Beers with our Big Barrel Aged Beer Bonanza! On Saturday, November 4th, we will be releasing not 1, not 2, not 3, but 4 Barrel Aged Beers brewed exclusively here in Pompano Beach! Some bourbon aged, some cabernet aged, all not to be missed. Oh and what makes a beer truly big (no, not bigly)? 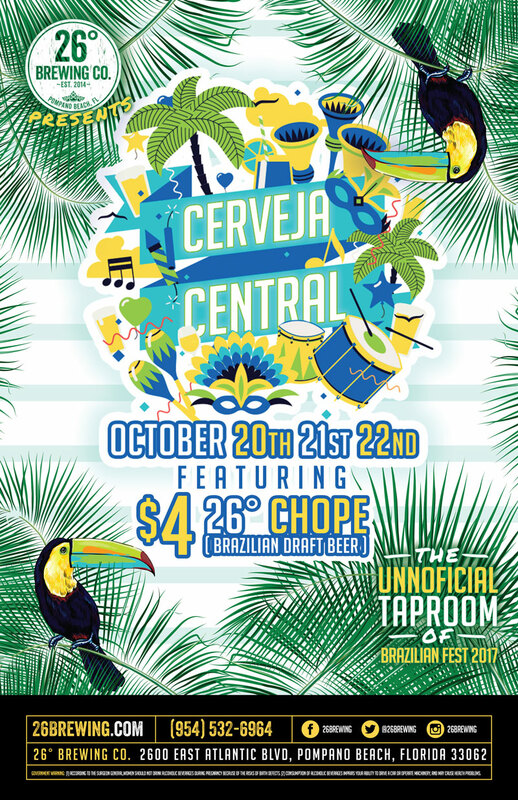 We welcome you to the Unnofficial Kick-off Party to the 2017 Brazilian Fest in Pompano Beach. We will be hosting a pre party Friday night for this weekend long event. Stop in Saturday and Sunday, either on your way to, or on your way back from the festival. The brewery will be featuring some great craft beer specials and some ice cold AC that you will most likely be craving. We will also be stocking you up on ToGo offers with our 6 pack and 4 pack can releases. See you this weekend, Pompano Beach! Many think this holiday is called Labor Day but at 26 Degree Brewing Company we call it LaBEER Day! Come Party with us all weekend long as we have 4 days of BEER, FUN and BBQ planned just for you. >>>> FRIDAY – We are releasing 2 more of our flagship beers in cans today. Come in and grab a 6-pack of TriCounty Lager and Jared’s Batch in their 12oz form, perfect for the beach, pool, and Labeer Day parties. These cans will be available al weekend or until supplies run out. >>>> SATURDAY – Join us for our Fall Home Brew Tasting Competition with the Hopoholics. – $15 gets you ALL-YOU-CAN-TASTE of these awesome Fall Beer entries. >>>> SUNDAY – We have a loaded day for you – Yoga at the Brewery – September 3rd, No Bull Brunch – Sunday, 9/3 at 26° Brewing and we are OPEN LATE so you can maximize your party time this holiday weekend. >>>> MONDAY – LABEER DAY – Come in and grab a 6-pack of TriCounty Lager and Jared’s Batch in their 12oz form, grab some to-gos and head to the beach, or stay in the cool a/c as we’re throwing a Texas sized party inside the taproom, with traditional Texas style BBQ cuisine from the E & J Texas BBQ, LLC food truck. If this is not enough Beer, Fun, and BBQ for you… You might not be doing LaBEER Day Weekend right. Don’t look now, but Summer has almost snuck away! Join us, as we celebrate the last of the long Summer Daze with craft beer darling, the IPA. NEW CAN RELEASE – White Oak IPA1A in cans! MANY IPA’S – We will have a plethora of IPA drafts for you to delight your summer day away. New breweries typically take it easy for their first batch on a new system; especially if the new 30-barrel system is 93 times larger than their previous garage-housed system…. but that’s not our style. We decided to rage with the most complex recipe in our repertoire, the grain-heavy imperial stout we so affectionately call Ziko’s Rage was our maiden voyage. On July 29, 2015 we brewed Batch 001 at 26 Degree Brewing Company. This July 29, 2017 we celebrate Ziko’s two-year birthday! Come relive how it all began! VERY RARE>>>> Ziko’s Rage Batch 001 – that’s right, we saved a keg from our maiden voyage. This is the same batch that took silver in the Best Florida Beer Championship. Aged to perfection, you will definitely want to try this side-by-side with a current batch. This is VERY RARE and will only be available in draft form. Special Ceremonial Tapping at 2 PM. VERY DELICIOUS>>>> Jim Beam Bourbon Barrel Ziko’s Rage – available in wax-sealed bottles and on draft in the taproom. This fan-favorite has been aging in Jim Beam Bourbon barrels since September 2016. Barrel Rage will be in full effect! VERY COLLECTABLE…OR NOT>>>> 4-packs of Ziko’s Rage Cans – this will be our first ever release of Ziko’s Rage in cans! You definitely want to get your hands on what will ultimately be a collectors’ item…or more likely, what will definitely be the first can release of Ziko’s Rage. VERY SPECIAL>>>> Special Hourly Releases of Chocolate Cherry Ziko, Hazelnut Chocolate Ziko, Coffee Ziko, and more! It’s that time of year when the days are long, the sun is bright and craft beer flows at every BBQ, beach picnic and house party. To honor this time in our summer, 26 Degree Brewing Company is releasing bottles of “liquid magic”, A.K.A. Citrus A1A, but only in limited quantities. This Citrus twist on our award winning IPA1A features flavorful notes of orange, grapefruit, and lime zest blended to create a refreshing IPA, made just for Pompano Beach’s favorite Season – SUMMER. Today is the day that we celebrate you, the Man. As this day precedes Father’s Day, we want to create a day to honor Fathers, Dads, Brothers, Uncles, Friends, and Men everywhere… a day where all men can come together, drink beer, and celebrate our Y chromosome. Nothing can be more American then some cold craft Brews, the musical Blues, and good ol BBQ! That’s how we celebrate our Memorial Day and we invite you to so the same. Come on down Monday the 29th and leave the prep work to us. We are going to be releasing some NEW craft beers this day for you to enjoy. We are going to have the down and dirty blues from the The Blues Crusaders on our stage. Leave the charcoal in the shed and let E & J Texas BBQ, LLC make you a plate of their famous BBQ specialties. This will be the perfect ending to your extended weekend plans. It’s Memorial weekend, the music festival is over and we’re OPEN LATE SUNDAY NIGHT. Come in for some late night fun. Don’t worry, you’re off tomorrow.